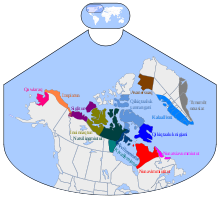 Inuit dialects. Inuinnaqtun is olive green. Inuinnaqtun (IPA: [inuinːɑqtun]; natively meaning like the real human beings/peoples), is an indigenous Inuit language of Canada and a dialect of Inuvialuktun. It is related very closely to Inuktitut, and some scholars, such as Richard Condon, believe that Inuinnaqtun is more appropriately classified as a dialect of Inuktitut. The governments of the Northwest Territories and Nunavut recognise Inuinnaqtun as an official language in addition to Inuktitut. The Official Languages Act of Nunavut, passed by the Senate of Canada on June 11, 2009, recognized Inuinnaqtun as one of the official languages of Nunavut. Inuinnaqtun is used primarily in the communities of Cambridge Bay and Kugluktuk in the western Kitikmeot Region of Nunavut. Outside Nunavut, it is spoken in the hamlet of Ulukhaktok, where it is also known as Kangiryuarmiutun. It is written using the Roman orthography. ^ "Census in Brief: The Aboriginal languages of First Nations people, Métis and Inuit". www12.statcan.gc.ca. Retrieved 2017-11-12. ^ Hammarström, Harald; Forkel, Robert; Haspelmath, Martin, eds. (2017). "Inuinnaqtun". Glottolog 3.0. Jena, Germany: Max Planck Institute for the Science of Human History. ^ a b "Iñuvialuktun/Inuvialuktun/Inuinnaqtun". languagegeek.com. Retrieved 2010-01-20. Harnum, Betty, Janet McGrath, and Margo Kadlun. Inuinnaqtun Lessons Phase 1 : Copper Dialect of the Inuit Language. Cambridge Bay, N.W.T. : Kitikmeot Inuit Association, 1982. Harper, Kenn. Current Status of Writing Systems for Inuktitut, Inuinnaqtun and Inuvialuktun. [Yellowknife, N.W.T. ]: Northwest Territories, Culture and Communications, 1992. Inuinnaqtun English Dictionary. Cambridge Bay, Nunavut: Nunavut Arctic College, 1996. This page was last edited on 30 January 2019, at 20:53 (UTC).